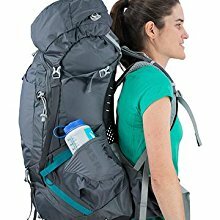 Osprey Aura 50 AG pack for women is an award-winning top-quality mid-size backpack suitable for weekend and multi-day backpacking and hiking tours. It has been slightly modified in 2018, so have a look at what it offers now. Osprey Aura AG 50 Backpack Womens. This backpack has been on the market for several years already, and in 2018 they have made some minor changes in it. I blogged about it in my recent text. You will recognize this new version by the inverted U-shaped symbol on the front pocket. If you are not familiar with this series, it includes this pack of 50 and a larger of 65 liters. The corresponding packs for men are under the names Atmos 50 AG and Atmos 65 AG. In any case, if you are looking for a tool which will serve you for many years, the Aura 50 AG is the one. This is a gender-specific pack full of features, absolutely worth the money you invest in it. Very good quality materials are used in the construction of this pack. So you have very durable fabric on the bottom and on the edges, while a stretchy fabric is used in some other sections. The pack is hydration compatible. There is an internal sleeve in the main compartment, and the water hose can run on either side along the shoulder straps. The pack is a top loader so you have the classic lid and the collar underneath it. But there is also a bottom compartment with a removable divider so you have two access points. Now, I dislike the divider which they added here. It is not with a zipper, so any small item you put in the main compartment will slip into the bottom compartment. To see a proper divider, have a look in this Deuter Futura Vario 50 where nothing can pass from above. Tensioned full peripheral aluminum frame. Top-to-bottom suspended mesh which wraps shoulders, back, and hips for a fully integrated fit. Adjustable suspended harness with structural load lifter bar for load transfer and comfort. Suspended mesh hip wrap for load transfer and comfort. The first thing you will notice here is a seamless and continuous mesh system which spreads all over the back of the pack from the top to the hip belt and lumbar area and over the shoulder straps. This mesh is designed to take the shape of your body and to hug you in such a way that the weight is distributed evenly over a large surface. This removes the usual hot spots, and you have the feeling that the pack is far less heavy than it is. Hence the letters AG. At the same time, the mesh is tensioned and separated from the back of the pack, which adds to ventilation. Such tensioned mesh is introduced for the first time by Deuter, and it is used in some of Gregory’ packs as well. Yet another element which adds to the ‘anti-gravity’ feeling are the mentioned innovative rigid load lifters. They are underneath the ‘normal’ load lifter straps which you see in the picture below. The idea behind this feature is to give support to the weight that is above your shoulders. The AG suspension – one of the best on the market. A few words about the hip belt. 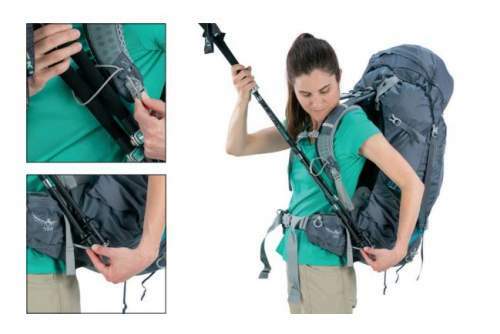 When the pack is not on your back, the belt closes itself, so it is not as you see in the picture above. This is because of the permanent tension created by the mentioned seamless mesh. To put the backpack on, you have to spread the hip belt. Now, the whole belt structure is a bit rigid, so it works great for backpacking but less great if you are forced to move on a ridge or to scramble. There are better packs for this purpose, with pivoting belts. I already mentioned the Deuter Futura Vario 50, this is one pack with such a design. Note also that the sternum strap is adjustable and with a safety whistle. In addition to this, the pack is built in 3 different sizes, XS, S, and M, so you will surely find your best fit. So you have a sliding harness which can be moved up and down very easily. There are some markers on the side to guide you. For the hip belt, you have what they call the Fit-on-the-Fly system. This implies extendable padded fins on the belt; they can be moved forward and backward and fixed into position through Velcro tabs, see the picture below. This all can be done without removing the pack from the back, clever isn’t it? There is ventilation on the back. The shoulder harness is specifically curved to create an anatomical fit for a woman’s neck, shoulders, and chest. Typically, women’s hips are conically shaped and with a larger difference between the waist and hip measurements as compared to men. So this pack’s hip belt is designed angled to accommodate this difference. This all allows for a more comfortable load transfer and support. The pack is shaped narrower and deeper, allowing for a greater freedom of movement and an increased stabilization. The position of the load is lowered to fit woman’s center of gravity. The mentioned unique suspended mesh is contoured to fit a wide variety of body shapes and sizes. This is what they call a perfect custom fit. This is one of the most remarkable features of Osprey, available on the majority of their packs, not only on the AG series. So you have an attachment loop on the lower section on the left side of the pack and one bungee tie-off on the left shoulder strap, see the pictures below. This is used to stow trekking poles when you are on move, for example when you want to take a photo or to have some snacks, without a necessity to stop. The Stow-on-the-Go poles attachment system. This is a top loading pack with the top lid which is adjustable, floating-type, and it is, in fact, removable as well. See the picture above. There are many packs with removable lids, but Osprey has come with yet another nice feature here. So you have an integrated flap which is used when the lid is removed. It has its toggles that match those on the front straps. Consequently, you can still close the pack nicely and protect it from elements. One nice detail here as well – the buckles on the FlapJack have some tiny pockets where you can hide them so that they are not on your way when the flap is not used. This flap can be useful if you want to use this pack as a daypack because without the lid its size is reduced visually and practically, and it still looks really great even without the top lid. There are 2 zippered nice size pockets on the hip belt, one on each side. On the lid, you have 2 zippered pockets, one on top of another. One is small, suitable for a map or similar items, and one is much larger. Access to both is from the back of the pack. One big stretchy mesh pocket is on the front of the pack. 2 stretchy mesh pockets are on the sides of the pack. They have two access points, from the side and from the top. This is useful for water bottles. The most important difference is the bottom compression straps which they have added in this 2018 version, this was not available in the 2017 version. Note that they are removable. The bottom compression straps are a new feature here. There is a compression strap inside the collar to cinch the load from above. On the sides, you have dual compression straps, the lower are V-shaped. The pack is also equipped with dual loops for ice axe and poles on the back. 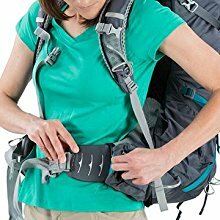 So you have lower attachment loops and bungee tie-offs higher on the pack. Note that the latter have their own tiny pockets where you can store them so that they do not catch branches when you walk through the bushes. So many small but useful details. Note that the rain cover is available with the pack on the EU market. As far as I know, it is not available with the pack on the Amazon-US. Regarding the missing side zippered pocket, this is something I love to have in my packs, but this is not a true objection. In fact, I know that some people dislike them, and they prefer such a sleek design. Is it heavy? It depends on what you choose to compare with. It looks heavy, but heavy packs carry a heavy load. But if you compare it with some other load-hauling tools, it looks moderate. See this Mountainsmith Lariat 55 which is also for women, it is much heavier. But wait to see the comparison table below. The price on Amazon as of the moment of writing this text is $240. So this is steep but the pack is top-notch, you will not find many better packs on the market. Three sizes: XS, S, M.
– XS: 4 lb (1.81 kg). – S: 4 lb 2 oz (1.87 kg). – XS: 2685 in³ (44 l). – S: 2868 in³ (47 l). – M: 3051 in³ (50 l). – M: 18 – 21 in (47 – 53 cm). – S: 30.3 x 14 x 14 in (77 x 36 x 36 cm). – M: 32.3 x 14 x 14 in (82 x 36 x 36 cm). Here I give the Aura 50 AG side by side with two other packs from the similar size range. This can help you in making an informed choice. I choose the Maven on purpose, to show a pack that has it all and yet it is very lightweight. Note that the Maven is built in two sizes, 53 and 55 liters, so I take the smaller here in the table. The other pack is from a new Mountainsmith series, an ultra-lightweight pack, but it lacks many features available in the other two packs. You might think that I am comparing apples and oranges, but the carry weight of this pack is almost the same as of the Osprey’s pack, and it costs almost twice less. So you have plenty of reasons to follow the links in the table. To conclude this review of Osprey Aura 50 AG pack for women, this pack comes at a price but this is a truly advanced tool and a great value for the money, I hope you have realized this from the text above. I can fully recommend this pack to anybody. This is an exceptional design, but I do have some objections, so you might want to bear them in mind. I also gave some alternatives in the comparison table above. You should know that all the features presented here are also available in the Aura 65 AG for women, and in the corresponding Atmos series for men. You can see the texts about Atmos 50 AG and Atmos 65 AG within this site. This is just to know if you need a bigger pack for women or a pack for men. 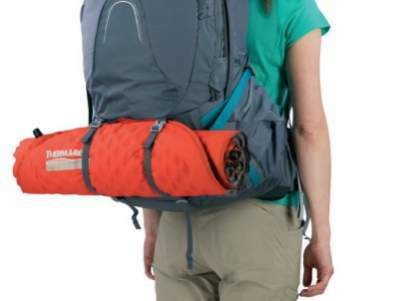 You might want to compare this pack to the Deuter Futura Vario 45+10 SL pack for women. I hope this text has been useful to you and if so please share it with others. 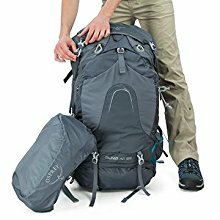 Do you have any experience with these packs from Osprey? I shall be happy to hear from you, there is a comment box below. Thank you for reading and have a nice day. I’ve surfed to your site searching for a specific data which appears to be “top secret” or am I bad at googling :); namely, the length of “the hard part” of the backpack; in other words, the length of the backpack without the lid or with an empty one. The dimensions are always quoted for a fully loaded backpack, that is, the maximum length etc., as e.g. here where it is 75 cm. You’ve probably already guessed why I’d need this data; yes, I’d wish to figure it out whether this (or any other) backpack be suitable as a carry on luggage; for this it should be less than 55 cm. Other dimensions are not so crucial as the backpack is “soft” in other two directions and they can be regulated with the compression straps. Hi France, I understand what you ask and why, this is a great pack and it is a pity to let them handle it carelessly. But I think it is unlikely to fit as a carry on luggage. The hard part (backboard) depends on the size, and I am sure it is in the range 57 cm (for XS) and 66 cm (for M size). Sorry to disappoint you. Wow, this is the kind of review I was hoping to find. I’ve been looking for a backpack that would become my travel companion for several years to come, and this one seems to pretty much have every feature I need. It is a bit pricey but I guess it’s better to invest in quality equipment than to look for a new pack every few years. Thanks for the review, it has been very useful! Hi Paula, thank you. Your way of thinking is very close to my own, not rich enough to buy rubbish. My tools were expensive, but many of them are for lifetime, such a good quality. So I do not think they were expensive in true sense. 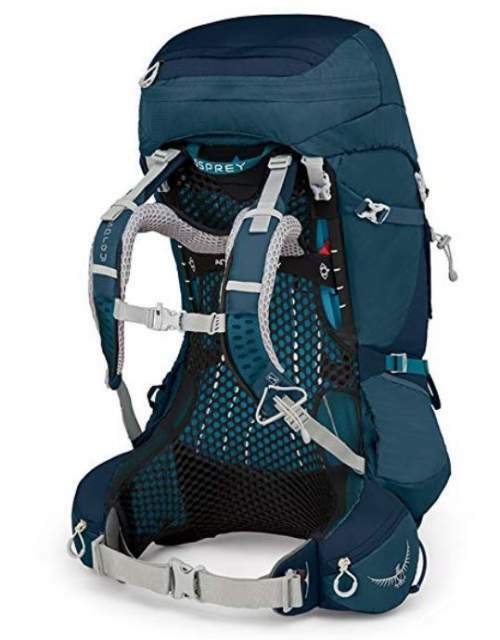 This is an excellent and fully comprehensive review of the osprey aura 50ag pack for women. Despite the high price, I agree with your rating as it has many special features that do not compare with the others in it’s class. I am in the market for a pack such as this and you have just made up my mind for me! Hi Kris, thank you. If this Osprey Aura 50 AG pack is your choice then you have chosen wisely. Wish you all the best.